False teeth come in the form of partial or full dentures worn in your mouth to replace missing natural teeth. They improve your appearance and help you chew, but they sometimes cause gum pain. The discomfort may come from various sources. It can usually be relieved once you pinpoint and address the cause. A partial denture replaces some missing teeth, while a full denture takes the place of an entire mouthful of teeth. Both partial and full dentures are removable. A partial is attached to your remaining natural teeth, while the top part of a full denture adheres to the roof of your mouth and the bottom part sits against your lower gums. False teeth often cause gum pain until you get used to them. The Simply Teeth website explains a new denture may bear down too hard on bony areas if it does not fit properly. Your gums will hurt and develop sores until the fit is corrected. This is usually done by trimming the problematic area of the denture until the pressure is relieved. Dentures.net notes false teeth can cause gum pain even after you have been wearing your dentures for months or years. Initially, false teeth should fit snugly against the gums without any movement. The fit changes over time, and eventually your dentures begin to rub against the gum tissue. This leads to swelling and pain. Certain over-the-counter adhesives and creams relieve the problem temporarily. They stop movement by holding dentures firmly in place so they cannot rub and press. Eventually you must visit your dentist to have the fit adjusted or the problem will keep coming back. 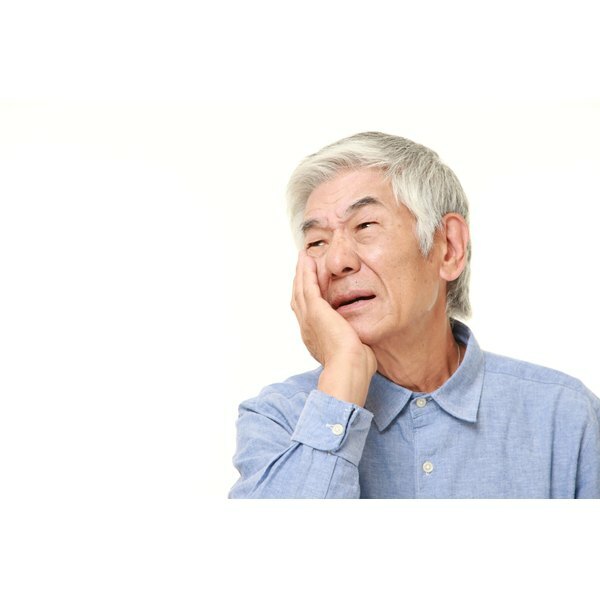 Your gums need time to recover from pain caused by false teeth, according to Dentures.net. The sores must heal and the inflammation must go down before you go back to wearing your dentures regularly. Take them out periodically to let oxygen reach the gum tissue, which promotes healing. Wipe your gums gently with a washcloth soaked in warm water. This soothes tenderness and reduces bacteria to prevent infections. Scrub your dentures thoroughly before soaking them to remove bacteria and irritants. Dental implants are another kind of false teeth. The staff at the Mayo Clinic warns the installation process can take many months and is sometimes painful because it requires cutting, but they are more natural than conventional false teeth when the implantation is complete. The American Academy of Periodontology explains implants support a bridge in patients who are missing several teeth and who would normally wear a partial denture. They support a full bridge or denture if all the natural teeth are gone. The implants hold the appliance firmly in place so it doesn't rub and cause gum pain.